The development of a prolapse has been determined multi-factorial. A number of factors that contribute to the development of a prolapse are well established, others are potential risk factorsGiven the conditions in which Nepali women are living, especially in rural areas, most contributing factors are more pronounced and of specific importance. 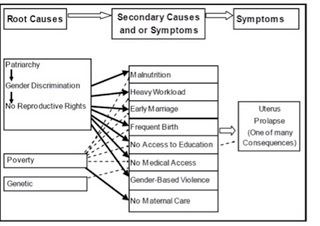 These and many more substantial variations of these figures point to the important insight that these factors reflect other issues such as the lack of education and information and lack of ante- and postnatal care.2These in turn are linked to fundamental issues such as poverty and a patriarchal societal construct. These issues are interdependent, being both causes and effects with a complex chain of feedback loops. In addition genetic makeup may be a direct predisposing factor and its effects can be magnified by the other causes. See fig 4. Most participants (women, health workers) in a survey did not recognize POP symptoms.10Women are also frequently not aware of which factors increase their risk of POP. And even when they are aware, they are often unable to exercise control over their lives and reduce their exposure to the risk factor. Caste, ethnic, religious, and regional identities have a significant effect on how women and girls experience the possibility to act upon the mentioned risk factors.